Today I reached the second very important milestone in this week: I have been working on a content branch for many months (greatly delayed due to the broken hand misery at the end of last year and during Q1 of 2017). Finally I finished most of the stuff (the one big open thing being the volcano quest - but even for that the stage has been set). 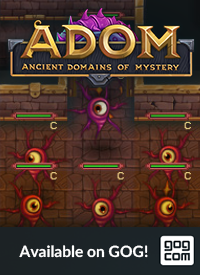 Everything has merged from my private development branch into the main ADOM development branch and now we are very close to the first test release (and then public releases) after a long time. Below you will find a summary of the most important changes you can expect for the next release. 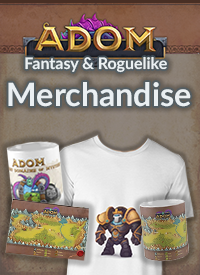 Together with the dozens and dozens of tickets we have worked on besides that content stuff you are going to face the biggest content release ever in the history of ADOM. Never before has so much stuff been added, modified or revised in one single release. Rechargeable staves have been added as an item category: http://www.adom.de/forums/project.php?issueid=4924 This brings items into the game that can be re-used after a certain amount of time has passed offering a plethora of new strategical options and magical effects to play with. 30 such staves have been implemented among the 82 new items mentioned above. 2 new fortune cookies, 4 new ancient dwarf stories and 2 new mad minstrel songs have been added. 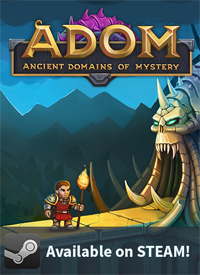 Last but not least the Rolf quest finally has been implemented: http://www.adom.de/forums/project.php?issueid=4933 It is a highly involved and very complex quest that probably will only be mastered by a few, but it will provide amazing new insights, features, items, and story lines into ADOM. Stay tuned and enjoy the impending release! So are the antidiluvian orcs and ancient dwarves gonna be part of that Rolf quest? Are we also gonna be seeing new music and art/animations too? This volcanoe quest also sounds quite extensive. Is it gonna have relations to the ice queen? Am I asking too many questions? Rolf's quest!! Oh my god, this is awesome! That sounds preaty cool! Thank you, Thomas! It have been monthes since my last game in ADoM, but you are dragging me back into all that awersome stuff to roam, explore and have fun. In ADoM joy is brought even through death. Oh my god. Time to get back into ADOM. Damn it, why do so many things have to compete for my free time!.. Thrilling news! Thank you for one of my favorite games of all time! Any chance for the Lithium Man challenge revisit? (playing on Steam client, done it three times already and the challenge did not pop).